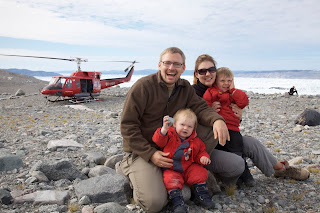 We recently traveled to Greenland for a week with our 3.5 year-old son and our 15-month daughter, for a variety of reasons. We were obviously not necessarily trying to optimize for a kid-friendly destination, and one of my concerns was how the kids would react on a trip with 3 destinations in a short week, plane, helicopter, boat, jeep rides, etc... and a limited amount of entertainment for them. The good news is that the logistics was much easier than expected, with high quality hotels and restaurants, punctual flights, etc... So we didn't have any issue to deal with on this front. We also got much better weather than expected, which helped with everyone's well-being. That said, emotionally, this trip could have been - and to be fair was at times- overwhelming for the kids. But overall, the kids did really great and I am sure they grew and learned a lot during that time. Charlotte, 15 months, got completely familiarized with the word/concept of "airplane" after flying in 10 of them in a 2-week period. Talk about learning by experience! And the bonus benefit was that the time difference between Greenland and California was only 5 hours, which helped us readjust to our timing after only 2 days. Much better than dealing with jetlag in Europe. Daniel, our 3.5 year-old, was required to step up to the task. His baby sister was somewhat uncomfortable with the new environment, and she needed a lot of our attention. She had the benefit of being carried in the baby backpack or in our arms most of the tour, though. So, she had it easy, being able to stay close to us and to sleep whenever she needed. Daniel had to act as a big boy. He had to be self-reliant in a lot of situations and he had to walk everywhere with us, whether it was long and strenuous or right during his nap time. He was a real trooper. He barely complained a few times that he wanted to get more of my attention (this was fair). We never had any issue with him not being up for the physical challenges, and this was a big relief. To these days, he still reminds us proudly how he climbed all the way to the glacier by himself. And he thoroughly enjoyed all the new experiences, whether it was the helicopter ride or seeing the iceberg collapse from the boat. Evenings were sometimes a little bit tough with him, probably due to exhaustion, the irregular schedule and the fact that our hotel room, which comfortable and clean, didn't have much to offer to an active kid. Also, given that the sun never set down, Daniel was often confused about what time it was (he had to ask for every meal what type of meal it was to reassure himself) and he often questioned whether it was really time to sleep. 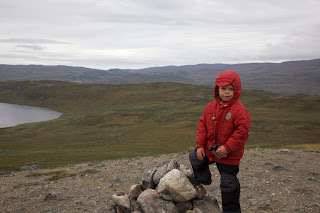 We ended up having to deal with tantrums and time-outs a lot more than we usually have to at home, which was so disappointing since he was doing so awesome during the day. At our last destination, Ilulissat, we ended up finding a playground where we tried to go every day, so that the kids could enjoy some unstructured, kid-friendly activities. Charlotte had obviously a different take on our trip. I think for her the main learning was dealing with new surroundings and a variety of experiences she was not prepared for. 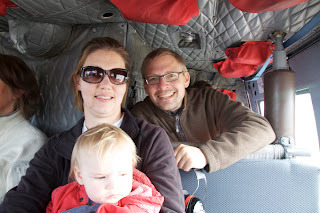 The first trip in a helicopter was definitely not her favorite, but by the time we flew back, she seemed to have already learned how to cope with it better. Overall, despite being very clingy, she seemed happy overall. She still tried to do her silly jokes at dinner table like she does at home, and she enjoyed the playground. She also learned a lot of new concepts from seeing new objects and hearing new sounds she hadn't been exposed to before. So, I hope that, despite the difficulties in adapting, she got some positive experiences out of this trip. At least, we have great photos from her to remember it! 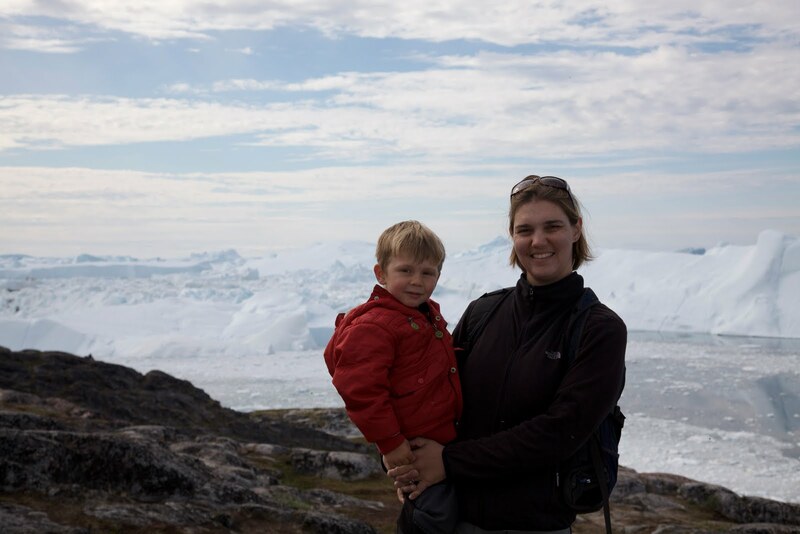 Hi...we are thinking of traveling to Greenland with a 6 month old...any thoughts on this?